Many forests are well adapted to severe, stand-replacing fire. 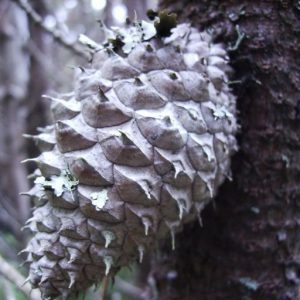 Serotinous pine trees have evolved cones that are held sealed shut with resin until the heat of a fire opens the cones, releasing seeds to establish the next forest. Although well adapted to severe fires with predictable and long (relative to tree development) fire-free intervals, it is unknown how shortened intervals between severe fires may “squeeze” populations of serotinous conifers, such that a second fire may occur before young trees have produced cones. Further, warming temperatures may delay cone production during the time between fires, adding another factor that could threaten serotinous pines in a warmer and more fire-prone future. 1) How does cone production, and the relative proportion of open vs. closed cones, vary in young post-fire stands of serotinous conifers? 2) How does the trajectory of cone development compare to fuel development following one stand-replacing fire, and where are there critical points where fuels outpace cones? 3) How do dynamics differ across systems with different controls on tree demography (e.g., water- vs. energy-limited systems)?